Södra has announced it will aim to increase the annual production volume of sawn timber at its Mönsterås sawmill by 100,000 m³, by 1 March 2019. The increase in production will reportedly require a third shift and approximately 30 new employees, in order for it to be achieved. 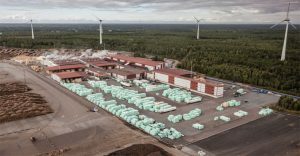 Over the past two years, Södra has implemented structural changes to its sawmill operations in a bid to strengthen its long-term competitiveness. Sustainable construction is said to be driving the interest in timber as a building material, with the underlying demand for sawn timber remaining high. The proportion of timber-frame buildings is also said to be growing all over Europe, due to the positive environmental effects, combined with construction efficiency and reduced transportation. Jörgen continued: “With our focus to grow with our customers, we need to increase production at Mönsterås to meet demand. “This is one of the reasons why we have entered the timber building system segment and are investing in a cross-laminated timber (CLT) facility at our sawmill at Värö. Production at the new facility will require a certain volume from the sawmill at Värö. The higher volume at Mönsterås will offset some of the volume we will use in CLT production.